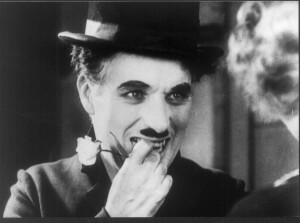 Charlie Chaplin has a plethora as films that are the worth the viewing time. From Gold Rush to Modern Times to his controversial The Great Dictator, but it’s City Lights which Chaplin wrote, directed and starred in that inspired the most emotional connection. Full of bawdiness and grace, the Tramp manages to increase his charm in a story that at its most basic form is about love. There was a time in history where The Tramp was the most iconic and recognizable image on earth. This film exemplifies why, with great heart, vulnerability, and humor. his sporadic friendship with an alcoholic millionaire (Harry Myers) to become her benefactor and hopefully more, resulting in almost an hour and a half of misadventure and hope. Like all Chaplin films, there is no easy path to his happiness and we watch as he stumbles and falls throughout the course of a story. It is purposeless to expand much on the storyline. The tramp meets the millionaire who is great friends with him while he’s drunk and will bestow gifts and money onto him as if nothing at all. But once sober he forgets the Tramp. The Tramp manipulates the friendship so he can help out the blind girl and later pay for her eye surgery. The film is so much more than the actual storyline. The magic about the Tramp is whilst watching we’re not missing anything by not getting the opportunity to hear him speak. (Chaplin was not a fan of talkies and used a tongue and cheek strategy to showcase his thought, with the opening political convention being filled with individuals whose speaking voice resembles farm animals and squawking more than human beings.) A master of mime, Chaplin was able to convey a multitude of wide ranging emotions with hand gestures and body motions and a face that was able to sell the last scene filled with such poignancy and sincerity that it lives as one of the most touching and effective scenes in film history. The ambiguity in the last scene is what makes it so beautiful, so utterly gripping and so iconic to film viewers. The Tramp is an outcast, a loner, set aside by society due to his social standing and his disheveled appearance. Yet, here stands the flower girl, sight repaired due to the operation that the Tramp paid for with high repercussions. She only recognizes him once their hands meet and then they lock eyes. “You can see now?” he asks on title cards. “Yes, I can see now” she responds. We’re left with an open ended ending. Is the girl okay with what she sees? Finally able to see the physical man that accompanied that image of him that she sought in her head. Does her affections for him stand despite who she is, and can she see past the obvious detriments to such a pairing? Or are their matching, watery smiles a mutual, silent understanding that circumstances are now different and while she can thank him, see him for who he is, nothing can pass that now. We don’t know. There is no clear happy ending like his other work in The Gold Rush, here we’re left with questions, with maybe some naïve wishful thinking and therein lies the beauty; it’s that a film from 1931 can instill such as romantic hope with not so much as a single word uttered.